The Green and Gold Mystery Solved! The story of how George Mason adopted the nickname “Patriots” is a mystery which has yet to be solved. It begins during the 1964-1965 academic year, the year George Mason College relocated to the Fairfax Campus. Though George Mason was not large enough to support an intercollegiate athletic program during its time at Bailey’s Crossroads – the student body never amounted to much more than two hundred – interest in sports was still high. There was a healthy intramural program during the early 1960s. Organized baseball, and football were played at local school fields and in the dirt parking lot of the college during this time. Things would change as Mason moved into its permanent quarters in Fairfax and begin to grow. In February 1966, the publication’s staff decided to move on to the next part of the contest, which asked the student body to vote on the name they liked best. The staff created a ballot which allowed students to select a nickname from ten choices. Names on this ballot included “The Chargers,” “The Marauders,” and “The Trojans.” Oddly enough, “The Patriots” did not appear on the ballot, which was printed in an April 1966 issue of The Ledger. The next month it was reported that the final vote ended in a tie between “The Marauders” and “The Trojans.” The paper urged more students to vote in the runoff election, pointing out that only 20% of the student body (about one-hundred sixty) participated in the name selection process. While the particulars behind the decision were not reported in The Ledger, the “Marauders” became the official name of the George Mason College basketball team for the 1966-1967 season. The first public reference to the basketball team’s new name was in a December 7, 1966 issue of The Gunston Ledger. Other George Mason College teams in existence during this time included an intermural football club, a rugby team, cheerleading and baseball. While the baseball team was called the Marauders also, the football teams were named after the team captains. Two of the football teams, “Ed’s Angels” and “Yancey’s Derringers,” were named after team captains Ed Fredette and Bill Yancey. The remaining teams, like the Rugby team, were simply called “George Mason College.” The Gunston Ledger frequently gave their own nicknames names to sports teams, referring to the Mason basketball team as the “Hoopers”  and the rugby team as the “Ruggers.” The Mason basketball team continued as “The Marauders” in both the 1967 and 1968 editions of the Advocate, but the program was not given any name in the 1967-1968 George Mason College Student Handbook. 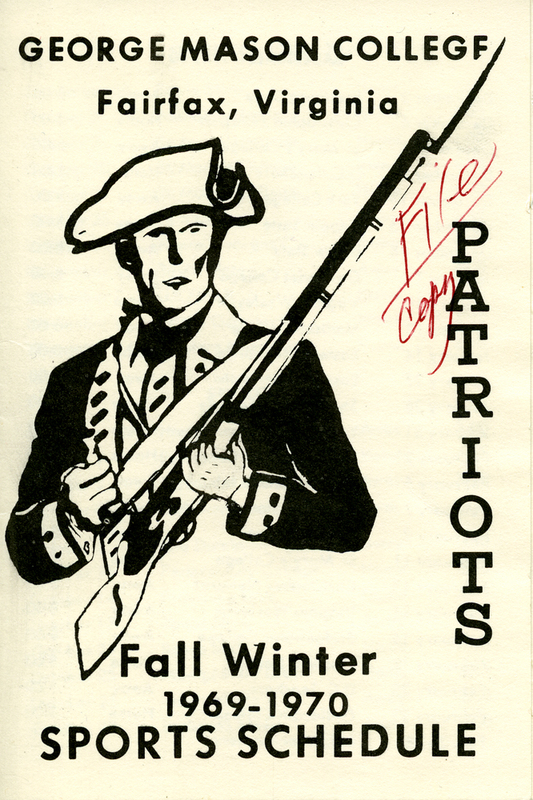 The name “Patriots” reappeared when it was first attributed to George Mason’s soccer team in a November 1968 issue of The Gunston Ledger. In the newspaper’s December 13, 1968 edition, Mason’s men’s basketball team was now referred to as the “Patriots” for the first time. In this same issue, the lead story was about the first annual “Patriot’s Day” on campus. This was also the first time that Wayne Grandy, a sports writer for The Ledger, published an article about Mason’s basketball program. In subsequent newspaper issues, Grandy would continue to call the team “the Patriots.” The George Mason College Student Handbook for 1968-1969 and the 1969 Advocate also referred to the basketball team the Patriots.